New Delhi, 17 July 2017: ‘Make in India’ initiative was launched by Hon’ble Prime Minister on 25th September, 2014 which aims at promoting India as an important investment destination and a global hub for manufacturing, design and innovation. The initiative is aimed at creating a conducive environment for investment, development of modern and efficient infrastructure, opening up new sectors for foreign investments and forging a partnership between government and industry through a positive mindset. CSO has released quarterly estimates of Gross Value Added from manufacturing for the last 3 years (i.e. 2014-15, 2015-16 and 2016-17). The details of this are enclosed at Annexure-III. The Government has been making consistent efforts to improve the growth of manufacturing in the country. 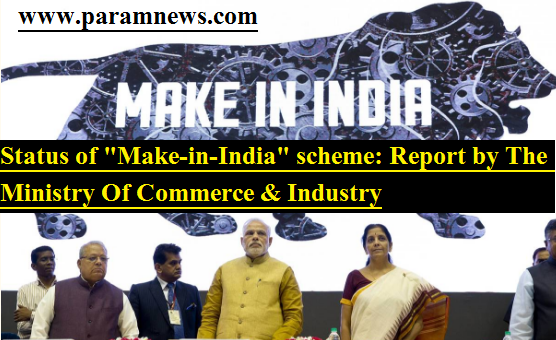 This information was given by the Minister of State (INDEPENDENT CHARGE) Of The Ministry Of Commerce & Industry SHRIMATI NIRMALA SITHARAMAN today in a written reply to a Lok Sabha question.